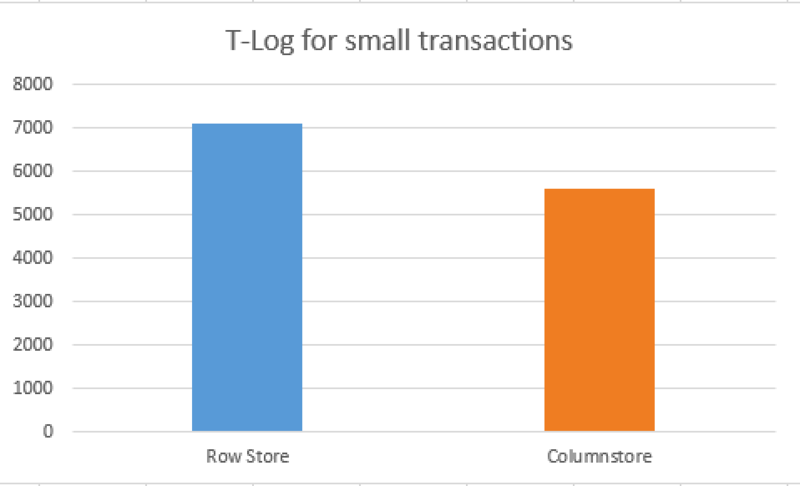 This post is dedicated to the Transaction Log behaviour, which might explain some of the behaviours of the Columnstore Indexes, observed in the earlier posts in the series. I decided to see what’s going on with Transaction Log whenever we load data and compare it with the same structures based on Row Storage. First of all let’s set up a source table (HEAP) with some data in it. I load 100.000 rows into the sample table. AS you see the log record length is 512 bytes and we are writing directly into the HEAP without Minimal Logging. The result is 7100 bytes, which is a nice number, but let's see what happens if we do the same with a Clustered Columnstore Table. It seems that for the Clustered Columnstore Indexes the table as itself is not being recognised as an allocation unit. Take a look at this picture, we have just 140 bytes per inserted row as compared to 512 bytes when inserting into HEAP based on Row Storage. On my VM it took 1 minute and 43 seconds to load this data, and the size for the T-log was 1.863.688 bytes for the Clustered Columnstore Indexes, while for the Row Storage HEAP it took 1 minute and 48 seconds (slower!!!) and 5.552.872 bytes which good 3 times more than in the Clustered Columnstore Case. I am quite confident that the difference in performance was small due to the storage speed - SSD has definitely helped Rowstore Heap to loose just 3 seconds to Clustered Columnstore, because for any other bigger cases we might be having a different waiting time, which could be measured in minutes. Great result, we have lowered our transaction log record size to 88 bytes right from the 512 bytes that we have had for sing simple transactions. Wow, we have managed to lower just 12 bytes to 128 bytes, that is nothing special to say at least, especially since in this case we are clearly loosing in the terms of the transaction log performance to HEAP. 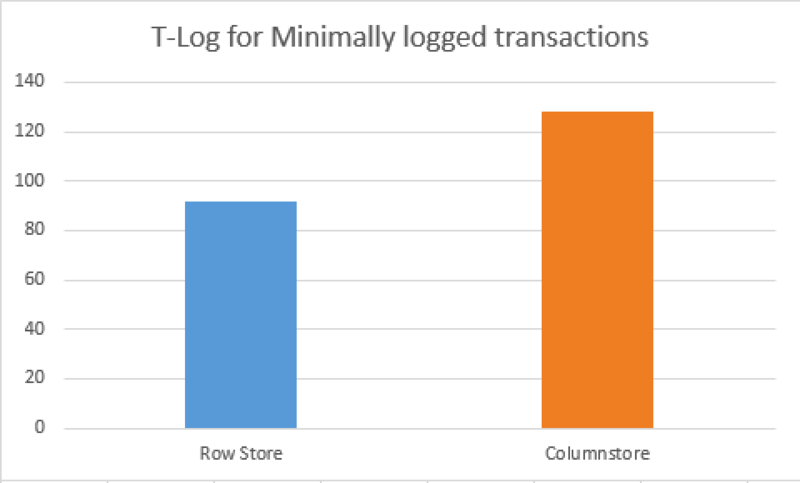 Now you can see the comparison between Minimal Logging for both Rowstore HEAPs and Columnstore Indexes. The difference in the transaction log size was enormous - 532.092 bytes for HEAP vs 12.876.632 bytes for Clustered Columnstore Table, which is 24 times more and which could result in quite a difference in the overall performance. The performance bottleneck will determine largely the performance of the whole system, and if in your case - the bottleneck is in the transaction log that is getting hammered - then by all means consider loading data by the minimally logged transactions, but if you can't sort data and can't get a table lock on the destination - than a different situation shall rise. Also, do not forget that if you are loading data into a HEAP that will be joined to a Columnstore Table as a partition, you will need to create Clustered Columnstore Index on it before switching it in, and if you are under the pressure of the total time for the data load, you might need to measure your system a couple of times before selecting what's right for your case. I highly recommend Data Loading Performance Guide written by some of the most respected people in the SQL Server world. First, thanks for your labor of love in writing all these posts about ColumnStore. Thank you for noticing and for reporting – I have corrected it now. Really appreciate your kind words & support.